“Maitreya clearly states that buddha-nature, or tathagatagarbha has four different qualities. We have seen that some of the great early Tibetan scholars explained buddha-nature almost as though it were a state of negation. One scholar countered that such a view is incorrect, given that Maitreya clearly showed how Buddha Shakyamuni did not explain buddha-nature as a state of negation. Some of the early masters dismissed this point in low-key way. In any case, what are the four qualities of buddha- nature? We can summarize this in a simple way by saying, ‘Buddha-nature is beyond duality mind.’ Characteristics such as permanent and impermanent, clean and dirty, pure and impure, self and no-self are all dualistic conceptions—they are the labels, restrictions, and distractions of duality mind. In reality, tathagatagarbha goes beyond each and every one of those boundaries. The Buddha taught this very specifically throughout his Prajnaparamita teachings. If you have the time or opportunity, it is good to read the one hundred thousand stanzas of the Prajnaparamita; I think this text has been translated into English. In this teaching, the Supreme Teacher states, ‘O Subhuti, noble sons and daughters engage in the Prajnaparamita, the wisdom that goes beyond. If you hold on to form as permanent, you are grasping; if form is impermanent, you are grasping; if form is clean, you are grasping; if form is unclean, you are grasping.’ When the Buddha taught this, he was uprooting the dualistic conceptions to which we normally cling. Duality will never discover the true taste of reality itself. By making and holding on to labels, we get caught and bound up in delusion; whatever we do will be like a pigeon who walks in a cotton field and gets caught in the cotton, or a pigeon who gets stuck in a lamb’s wool. We have a Tibetan word that refers to when a pigeon tries to walk on a lamb and gets stuck in its wool—that big pigeon can’t get out! When we discuss buddha-nature and study it according to the different systems of philosophy, it almost looks as though buddha-nature exists somewhere else, somewhere outside ourselves. Nonetheless, we are actually discussing our own innate nature. Buddhist philosophy establishes tathagatagarbha by means of logic and valid cognition, arriving at conclusions about the truth of the nature in this way. This is exactly what the Buddha taught; he said we should use logic and reason to examine the truth of his teachings, discovering and actualizing the nature in our own experience. In order to practice correctly, we need to develop certainty wisdom. Certainty and trust in the teachings will bring about the result of realization. Without the confidence of certainty wisdom, our practice will become shaky. 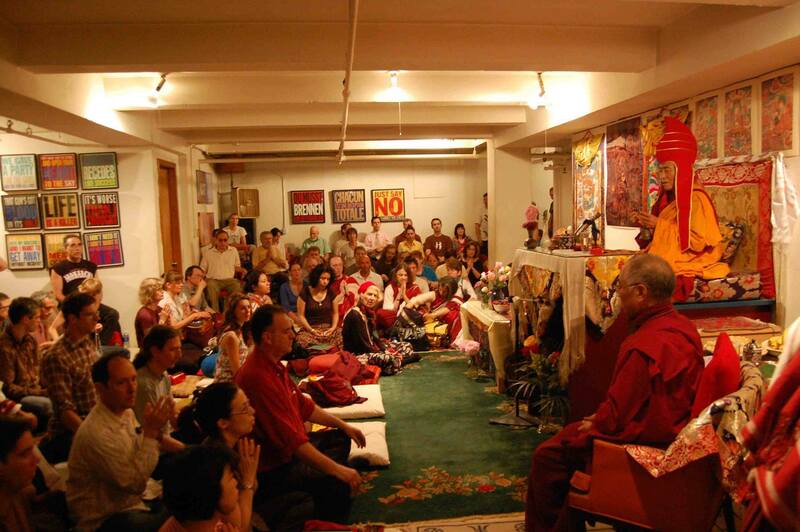 Photo of Venerable Khenpo Rinpoches bestowing a Tsasum Lingpa Vajrakilaya empowerment in New York City in 2009.